Temperature controllers are a very useful addition to your hot water system, they can prevent scalding accidents, save money on heating bills and are very convenient. You can fit different controllers in the Bathroom, Kitchen & Laundry etc. Temperature Control allows you to bath the baby at 38°C, the kids at 40°C and yourself at 42°C - it's your choice. 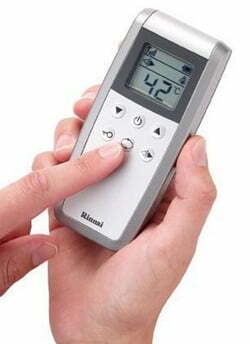 Temperature Control reduces the chance of scalding, particularly for children and the elderly. Temperature Control eliminates all fluctuations should someone else turn on another tap. Temperature Control enables you to simply set your desired temperature, turn on the hot tap and enjoy. No more wasting water juggling the hot and cold taps. This allows you to fill a bath to the desired level and at the precise temperature you want at the touch of a button. The unit will automatically turn off the hot water and a voice recording will advise you when the bath filling is completed. Select say 30 litres for young kids, 60 litres for older kids and anything up to 400 litres for large spas. This utilises the same features as above, but in a shower application. Select how much water you wish to shower with, your desired temperature and turn on the hot tap. As an example, if you have a AAA rated 9 litre/min shower rose and you select the 30 litre level on your controller, your shower will automatically shut off just over 3 minutes. If you need to wash your hair and it takes a bit longer, select 60 litres for a just under a 7 minute shower - the choice is yours. Control your hot water temperature from wherever you want within your home. The innovative Wireless Water Controller allows you to flexibly manage your hot water temperature. A Wireless Water Controller allows precise temperature control and helps to eliminate fluctuations, even when the water-flow is varied and more than one tap is used at a time; keeping your family safe from scalds. Simply select the temperature you want and turn on the hot water - never use the cold tap again. The Wireless Water Controller works in conjunction with a transceiver, which is connected by a short cable to the bottom of the INFINITY hot water system. The kits come with all you need - including batteries. We stock and supply temperature controllers from all the top gas manufacturers including Rinnai, Rheem & Bosch. For all temperature controller sales and service, contact the company you can trust, Australian Hot Water. Tempering valves are another way to regulate the temperature of delivered hot water for other hot water systems, including electric, gas and solar hot water systems. These are suitable for all the leading brands including Rheem, Rinnai, Beasley, Sanden, Vulcan, Dux, Bosch, Stibel Eltron, Aqua Max, Edwards, Zip, SolarArc, Hocking & Solarhart. For all tempering valve sales, contact Australian Hot Water. Australian Hot Water branches are strategically located to service all areas of Sydney, Melbourne, North Coast NSW, Gold Coast QLD, Canberra, and Newcastle. Service centres are located in Sydney at Alexandria, Belmore, Caringbah, Leumeah, Moorebank, Mona Vale and Seven Hills, at Port Melbourne, Cardiff in Newcastle, Fyshwick in Canberra, in regional NSW at Ballina and Lorne and in Burleigh Heads on the Gold Coast QLD. Australian Hot Water are the largest specialist hot water franchise in Australia.